Roman Emperor Claudius the Cruel needed Roman soldiers, but they were not volunteering. Why not? Claudius thought the reason was that they wanted to stay home with their wives. His solution? Ban marriage. A Catholic priest, Valentine, disobeyed him, marrying young lovers in secret. Off with his head! The priest was beaten and beheaded in 270 A.D. or maybe 278. The day was on or close to Feb. 14. It could have been the 13th, the Ides of February. 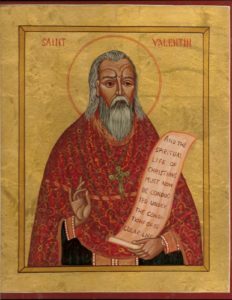 Valentine was named a saint and the faithful began celebrating the day of his martyrdom, which conveniently fell on the pagan festival of Lupercalia, a celebration of fertility. 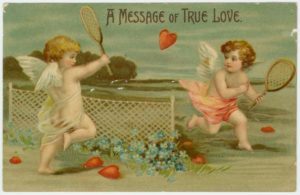 By 496 A.D, Pope Gelasius had enough of fertility rites – he declared the day St. Valentine’s Day. For the next millennia, people sang love songs to each other on this day. Then came the devastating battle of Agincourt in 1415. Among the many captured French nobles was 21-year-old Charles, Duke of Orleans. He was lucky to have survived – he was found in full armor so heavy he could not get up, buried under the bodies of his dead compatriots. Orleans was not so lucky in love. 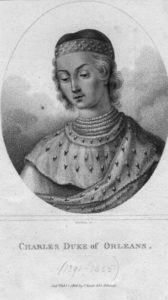 In 1406, the 12-year-old married his 17-year-old bride, Isabella of France, (she had already been a widow for seven years!) but she died in childbirth. In 1410, at 16, he married 11-year-old Bonne of Armagnac. Imprisoned in various castles in England for the next quarter of a century, the Duke spent his time writing love poems to Bonne, including what is thought to be the first written Valentine love letter. (His mother was named Valentina, so perhaps that had something to do with it.) This letter and many of his other letters exist. Unfortunately for the Duke, Bonne died a few years before he was finally released from captivity. At 46, he married his last wife, 14-year-old Marie of Cleves. The English were right to fear him – his only son became King Louis XII of France, but he did not live to see this. Today, one billion valentine cards are bought each year, 50 million roses are sent, and 36 million boxes of heart-shaped chocolates are purchased. And that is just in the United States! 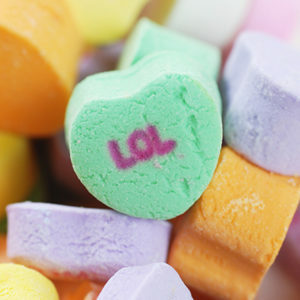 Then there are the millions of tiny candy hearts with messages, first made in 1902. Every year, NECCO updates the messages. So Happy Valentine’s Day! Great story! Keep these interesting historical “gossips” coming — you’re contributing to my education! Unbelievable writing. THIS needs to a movie. Love the way Barbara Ellis writes. Thanks, Judy! I love writing this HistoryGossip blog!